One of the tchotchkes I find myself collecting these days are an assortment of Hot Wheels cars, those little .99 cent pleasures of youth! These days Mattel is going a little crazy with their designs and licensing deals. As a result some of that has spilled over to the die-cast cars. HOT WHEELS, HOT FINDS will showcase the nerd-approved Hot Wheels that should be must-haves on your collectibles shelves or in your display cases. 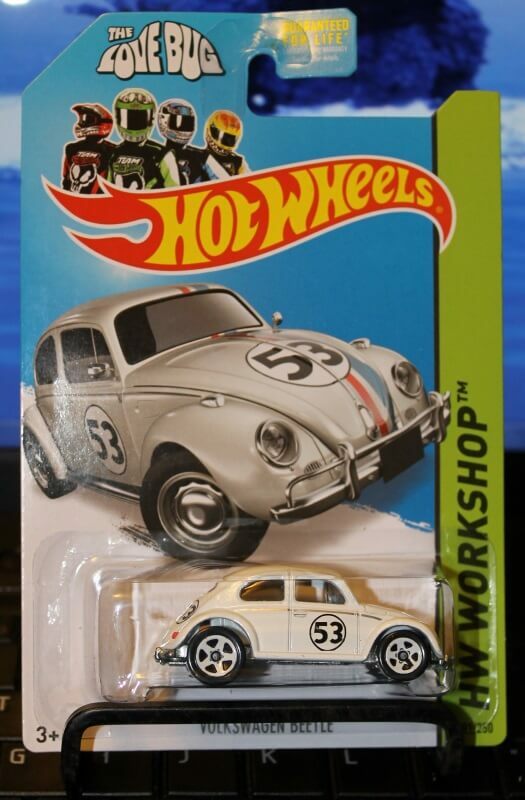 Hitting pegs as we speak is none other than Herbie The Love Bug from Disney’s film of the same title! A tricked out VW Bug, Herbie here is well worth the .99 cents (+ Tax) (.84 cents at Target this week). I’m pretty sure he’s on the rare side as I only found two in a freshly-stocked rack. More adorkable vehicles to come! Get out there and get finding! I love this Gregg! I have a few nerdy Hot Wheels as well.